Kudos to ACE, the genre paperback publishing arm of Grosset and Dunlap, for resurrecting D.E. 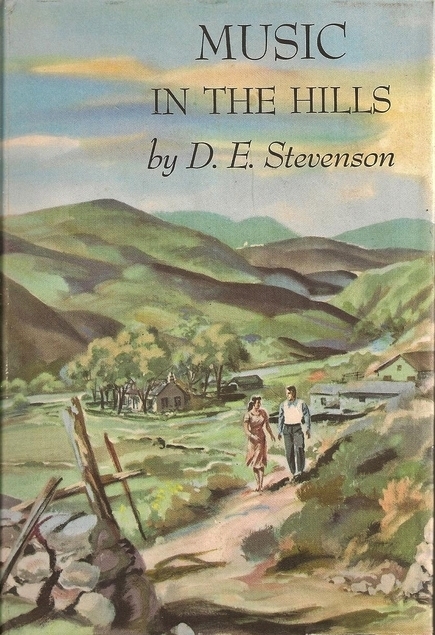 Stevenson back in the early 1970s, because without their editions D.E. Stevenson would be even harder to acquire than she is, but regrets for those goopy “romance” covers – soooo bad. I have to admit I hide these when reading in public. Well, we’ve had a fraught sort of summer this year, what with the local forest fires and all, and though we’ve come out the other side personally unscathed, we still feel rather rumpled in the mind. Hence the comfort reading. Nevil Shute and D.E. Stevenson have gravitated to the bedside stand, among others. Engaging but not particularly challenging. Easy to take up, easy to put down, patiently waiting for the reader to return and step back into the story. Most recently the books on hand are the comfortably charming Dering family novels. This is only the second time of reading them through since my introduction to D.E.S., and I enjoyed them even more so this time round than the first, because this time I read them in chronological order and everything clicked ever so nicely into place. I also recognised a number of characters from other books, which must mean I am becoming a genuine Dessie, tracing the strands of the spider-web from book to book to book – a delightful side pleasure of reading this not-quite-forgotten author. Cribbing from previous posts to put together this overview. I’ve gotten very much out of the blogging habit, much to my regret, so trying to get those rusty cogs a-turning again. 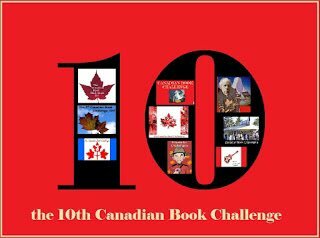 A little cheat feels justified, and I did so enjoy these books I thought them worthy of mention once again, even if I don’t have much new to say. Oh! I guess I should mention that there are spoilers throughout, mainly in the transition in focus from book to book. Each installment’s resolution leads to the opening of the next. If you are brand new to these and want to be surprised (if we can describe D.E.S.’s mild dramas as worthy of such a strong term) you might want to click away and come back once you’ve read them yourself. Collectively I would give this trilogy an 8/10 or thereabouts in my personal rating system (see sidebar), keeping in mind that this is in relation of these books in D.E. Stevenson’s body of work alone. Cover depicted is from an earlier hardcover edition, not the paperback referred to in the heading. 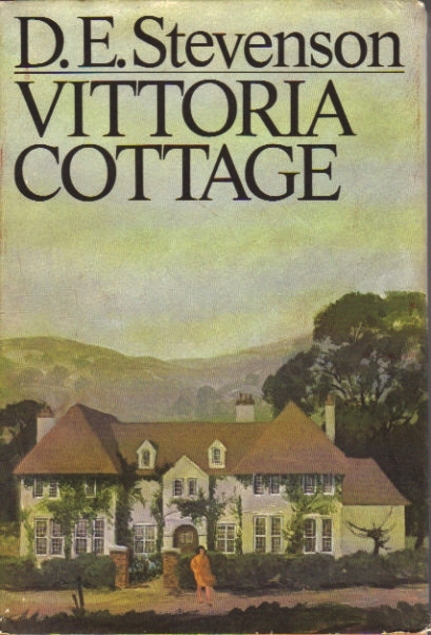 Vittoria Cottage by D.E. Stevenson ~ 1949. This edition: Collins-Fontana, 1974. Paperback. ISBN: 0-00-613-444-0. 191 pages. Middle-aged Caroline Dering has just been widowed, and, aside from her genuine and seemly sorrow at the death of someone who has shared her life for many years, she is not at all steeped in sorrow. 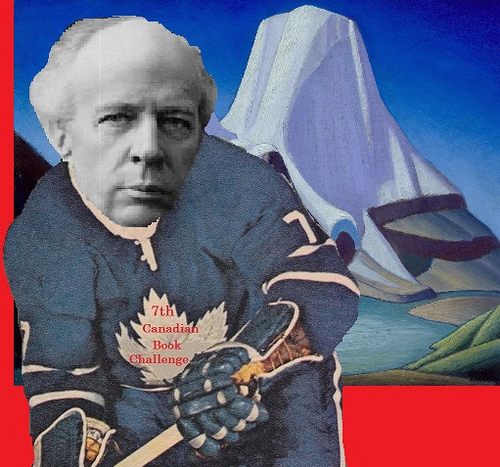 Her lately departed spouse, Arnold Dering, was of a complaining and perpetually malcontented disposition. While his wife and three children were accepting of his character – Caroline thought that he always meant well, and suspected that at rare moments Arnold recognized and truly regretted his deep pessimism – they enjoyed themselves much more in his absence. World War II has been over for several years, but England is still very much in coping and recovery mode. Society is fast changing into some sort of new normal, and though things are steadily improving, there is still food and fuel rationing, and a strong atmosphere of “making do”, which makes for some quite fascinating scenarios as we progress through the book and look over Caroline’s shoulder as she goes about her days. 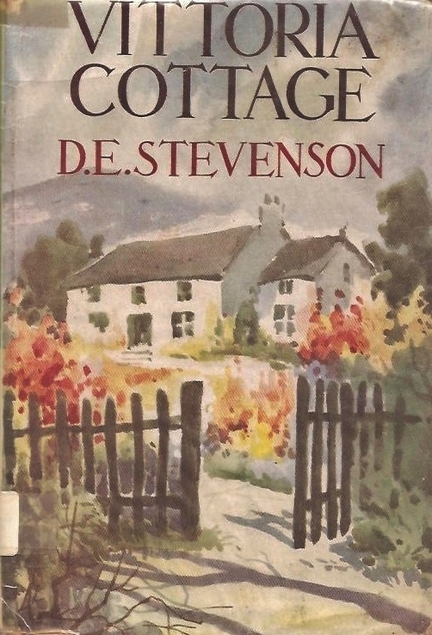 Another older hardcover edition, this one more accurately depicting the “cottage” which really isn’t. The scene is set for what is to become a series of three novels by descriptions of the village of Ashbridge and the far from cottage-like Vittoria Cottage, ancestral home of the Derings. Though she has merely “married into” the local family, Caroline fits into the local hierarchy almost immediately, and by and large leads a deeply contented life, caring for her children, volunteering for various worthy causes, keeping house and gardening. The children are all grown up, with James away in Malaya, and lovely but discontented Leda (she takes after her father in full) and boisterous Bobbie making their way out into the larger world from the safe haven of their village nest. Life in quiet Ashbridge gets suddenly quite interesting with the arrival of the mysterious Mr. Shepperton, who is apparently very reluctant to discuss his past, and who arouses even more suspicion because he appears to have no old belongings or clothing, a real rarity at that place and time, immediately post-war – “everything new!” the village gossips whisper with raised eyebrows. Caroline’s lovely younger sister Harriet, a successful actress ducking away to her sister’s home for a respite from a difficult and failed recent stage production in London, brings some sophisticated dash and sparkle to village gatherings, and with the unexpectedly sudden return of James from Malaya, and the trials and tribulations of Leda and her fiancé Derek, the local squire’s son, there is plenty of scope for complications, dilemmas, surprises and sometimes unexpected resolutions. I thought the characters were very well drawn and (mostly) very believable. Caroline is our heroine, but she is not a perfect person by a long shot; her flaws are well on display, but we forgive her them because she is ultimately exceedingly likeable, as is her sister and most of the other players in this excellent domestic drama. It ends quite abruptly, but this served merely to make me keen to get my hands on the next episode in this extended tale. Music in the Hills by D.E. 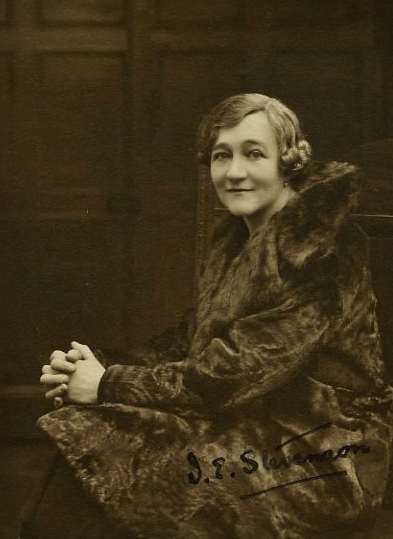 Stevenson ~ 1950. This edition: Ace Books, circa 1970. Paperback. 282 pages. Having more or less settled the fates of Caroline Dering and her sister Harriet Fane in the previous novel, Vittoria Cottage, this next installment in the trilogy follows Caroline’s son James, who, at loose ends after his military service and several years spent “chasing terrorists” in Malaya, is looking towards his future. 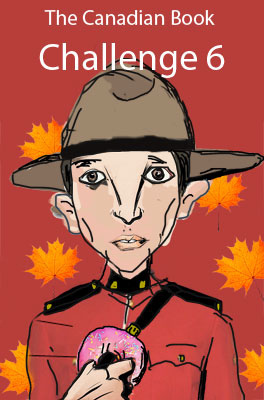 Deeply in love with his childhood companion Rhoda, he is struggling with her rejection of his marriage proposal. While we suspect that she is in love with James in her own way, Rhoda fears that, as a rising professional painter, marriage would spell the end of her career goals, and that she would be a discontented wife as well as a poorer artist, having to split her focus between two roles, doing neither well. James takes it very well, all things considered, and hies himself off to the community of Drumburly in Scotland, where he has been invited by his aunt and uncle to reside at the remote Mureth House, a prosperous sheep farm. Jock and Mamie Johnstone have no children of their own, and are hoping that their nephew might be interested enough in farming life to take over Mureth some day. We have sheep rustlers and romantic entanglements and, of course, more than a few misunderstandings between various parties, all neatly tidied up as the story progresses, in proper D.E. Stevenson fashion. 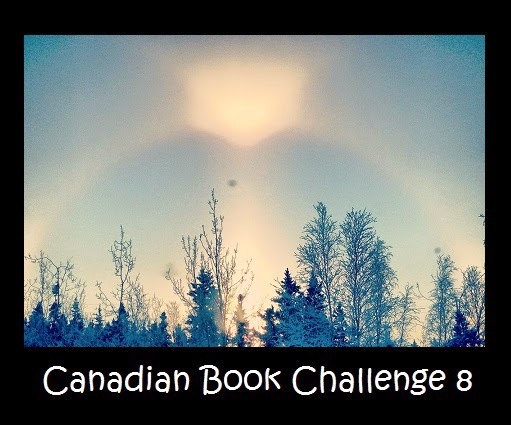 Shoulder the Sky: A Story of Winter in the Hills by D.E. 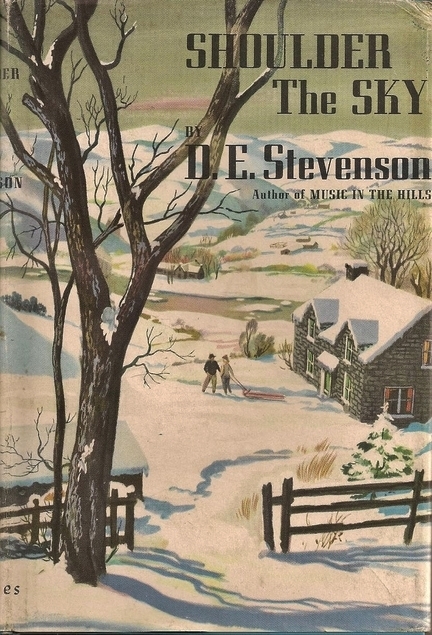 Stevenson ~ 1951. Original British title: Winter and Rough Weather. This edition: Ace Books, circa 1971. 275 pages. Five years after the conclusion of the Second World War, a young, newly married couple, Rhoda and James Dering Johnstone, arrive at their isolated farmhouse near the fictional Scottish village of Drumburly. Rhoda is an accomplished professional painter, and her husband worries, with some reason, as to how she will adjust to a life as a sheep farmer’s wife, far from the stimulating world she has happily abandoned for true love. Rhoda drifts for a while, mulling over the dilemma of what she sees as a black and white choice between her perceived role as a wife versus personal fulfillment as an artist. The author handled this theme sensitively and sensibly, though I couldn’t help but think that childless Rhoda, overseeing a small house with the help of a live-in cook-general, had a luxury of a “domestic support system” impossible for those of us in a similar societal-economic position to attain today. Rhoda ultimately returns to the studio, and proceeds to paint a portrait which has far-reaching consequences among the local residents. Add in several on again-off again love affairs, a missing wife, a bullying neighbour, a misunderstood child, and the challenges of winter storms in an isolated locale, and you have a quietly dramatic novel, very occasionally straying into melodrama, but nicely anchored to reality by the author’s pragmatic asides. There is one glaringly “coincidental” plot twist which I rolled my readerly eyes at, but I forgave it for love of this writer, as we note and yet forgive the foibles of our dearest friends. The author set this novel up well, and the details she gives both of farm life and the art world read like they come from personal experience. I thought this particular novel was a relatively strong work for this “light romance” author, rather reminiscent of O. Douglas, what with the Scottish setting and the deep moral dilemmas and all. Deeply affirmative depictions of marriage form this book, in particular the partnership between the older couple, Jock and Mamie Johnstone. D.E. Stevenson is all about the quiet joys of making things work out and the moral and emotional rewards that follow acting well towards each other, though her characters also struggle in a utterly lifelike way with holding it together when faced with uncongenial people and trying situations.